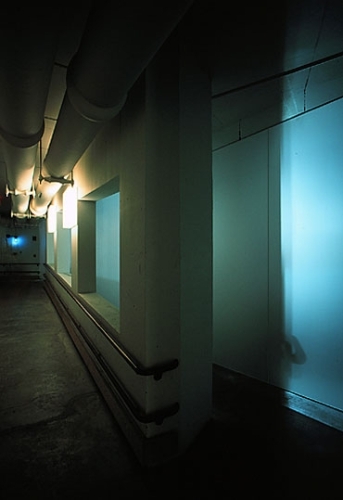 A labyrinth of underground corridors connects nearly 100 buildings of the Massachusetts Institute of Technology. 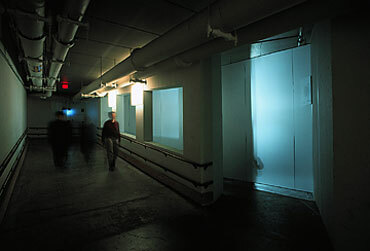 Passage was installed at a peculiar landmark in this subterranean maze, a triangular space that was intended to be the junction of three corridors. The third corridor was never connected. The dead end space is unoccupied – these are the silent and functionless ruins of an unrealized construction. Unusual formal qualities give this space the potential to function as a landmark within the anonymous corridors, however, that potential has been eroded. The space receives little attention, as it has no apparent function. It has become familiar and ordinary to the people who pass by every day. A translucent partition bisects the triangular space. Behind the partition a floodlight casts silhouettes of the obscured portion of the structure onto the screen. This ‘architectural projection’ reveals previously unnoticed details, such as railings and light fixtures. Only a narrow space remains accessible to the audience. Ironically, the partition provides access to new spaces for the audience as it obstructs their passage beyond it. What lies behind the screen must then be reconstructed within the space of memory.